On June 17 at approximately 10:40 a.m., Calcasieu Parish Sheriff’s Office deputies responded to a call in reference to a 4 year old child being home alone. When deputies arrived they were advised by the complainant that someone informed her there was a young child crying on a balcony on the second floor of one of the apartments. The complainant told deputies she went to the apartment and knocked on the door but there was no answer. She entered the apartment with a master key and found the 4 year old child standing on a chair leaning over the edge of the balcony. The complainant also told deputies that she checked inside the apartment and there was no one else inside. A short time later Ivona M. Sweet, 21, Walters Street, Lake Charles, arrived at the apartment complex and stated that she had gone to work out and left the 4 year old family member alone. When questioned by detectives Sweet said that the child was sleeping and did not think the girl would wake up before she returned home. 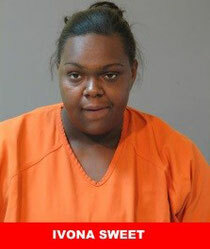 Sweet was arrested and booked into the Calcasieu Correctional Center and charged with cruelty to a juvenile. Judge Sharon Wilson set her bond at $10,000 and she bonded out later the same day. CPSO Detective William Wilcox is the lead investigator on this case.